This Monday I will be another year older. I am slowly leaving the ‘mid-20’s’ and heading towards 30. Wow, just writing that is scary. Me? 30? It just doesn’t seem right. I still feel like I’m 18, well maybe not in the energetic-sense, but the maturity-sense. I think what I’m trying to get at is I still want to be immature and care free, and stay out to 3am like I use to, and not feel like death the next day. Maybe. Those days are gone. Now it’s all about bills, and more bills, and oh wait, what do I see there – another bill. I’m whinging. I shouldn’t be. I’m actually very lucky and am enjoying a great time in my life! If it only weren’t for the tired part. You’ll probably listen to me rant on about this again on Monday. 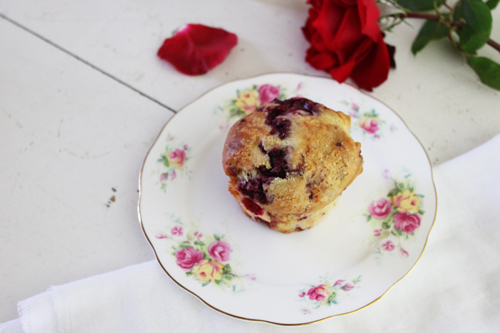 For now, I’ll break and tell you about these awesome little muffins I made lately. These come from Donna Hay’s book Simple Essentials - Chocolate, and they are very quick and easy to make. The best part about them is you can freeze them and pop them in the microwave and they taste even better! These aren’t those fluffy, big style muffins, but muffins which have a nice crisp top and a delicate stump. Just like all muffins, these are best eaten straight away, but don’t despair, a quick zip in the microwave and they just as good again. In a large bowl, sift the flour and sugar and mix. In another bowl, add the sour cream, eggs, lemon ring and oil, and mix until combined. Stir the wet mix into the flour. Fold through the raspberries and white chocolate, and spoon the mix evenly into a muffin tin, with or without paper cases. If not using paper cases, grease the muffin tin well. 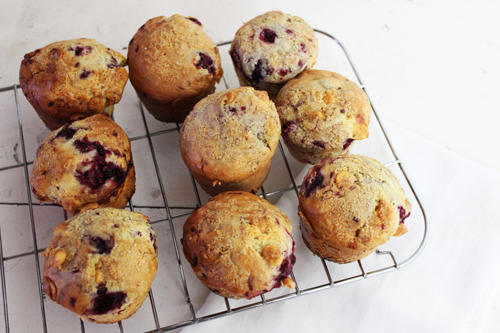 Sprinkle a little of the extra sugar on top on the muffins, and bake for 25 – 30 minutes or until cooked. Makes 8 large or 12 medium. hahaha - I feel your pain about getting older... I keep having to remind myself that I am actually supposed to be an adult (having left the 18-25 age bracket) and am also moving towards the 30 mark. It scares me that I won't be graduated or earning $$ until 30, but it is funny I bet I will still think I am 20 when I reach that point. Yumm those muffins sound delish! Anything with raspberries is a winner by me! !